Do you have a growing family? Do you want that family room that you’ve always dreamed about? If you answered yes to either of these questions you have two choices, either sell your existing home and buy a bigger one that has the living space you desire or build a home addition. Either path takes money and time, however, if done right often a home addition is the more cost effective solution. It also disrupts the family less, particularly if you want to stay in the same town and school systems. This said, building your own home addition is not a simple task. By all rights, it’s like building a small house, particularly if the addition includes plumbing. Also, unless you have prior home building experience and are unemployed do not waste anymore of your time fantasizing about the possibility of framing, sheathing and overall building the home addition yourself. It’s too much to take on for one part time inexperienced person. Hire a home remodeling general contractor instead to manage the project. Use this room addition bid sheet to find the right general contractor and to properly educate yourself on the work and key issues that need to be considered when building a home addition. So before you decide on building your own home addition take a reality check and plan accordingly. Summarized below is a list of the key considerations you’ll need to figure out before embarking on building your addition. The first thing you should do when going down the path of building a house addition is to develop a set of building plans and a budget. The plans should be as detailed as possible. You may want to invest in a home design software package such as (Punch! Professional Home Design Suite Platinum Version 10 ) to develop you home addition plans. Developing a target budget is also just as important. The more detailed your building plans the more accurate you’ll be able to estimate costs for the addition. You may also want to meet with an architect and have him or her develop the home addition plans for you. Hiring the right general contractor is key to a successful home addition project. They will coordinate the construction of the addition and hiring all of the sub-contractors. They will also bid on the project based upon your plans. Again, the more thorough your building plans the more accurate they will be able to bid on the project, thus mitigating the possibility of cost overruns down the road. Find a local remodeling contractor here. Call any neighbor, friend or family member in your local area that may have used a general contractor to build their home, home addition, or even remodeled their home. Use one of these home remodeling checklists to save money, time and hassles on your building project. Alternatively use a national contractor referral company to find a general contractor. These companies have done thorough background checks on any contractors they include in their databases. Finally, make sure to check references on any contractors you consider hiring. With building plans and solid cost estimates in hand, and a general contractor selected, it’s now time to approach banks for a loan, if you are planning on borrowing money for building your own home addition. Prior to building your addition you’ll need to pull permits. If you’ve hired a general contractor they may be able to pull the permits for you. The permits will need to be posted in a visible site on the home. The permitting process will trigger building inspections during the construction of your home. It will also notify the tax assessor to come out to your property when the addition is complete. Yes, expect to pay more in property taxes when the construction is complete. Demolishion work will most likely be required on your existing home when building a home addition. For example, siding from one or more sides of the home may need to be removed. A deck may also need to be removed. The first step in actually building a home addition is excavating a hole for the concrete footings and the slab or foundation walls. The concrete is then poured afterwards into concrete forms that have been installed. The forms will normally need to stay in place for 2 or 3 days after pouring the concrete into them, before they can be removed. After the concrete foundation walls or slab have cured the framing can begin. This is where the home addition really begins to take shape. 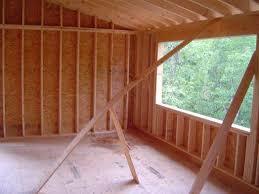 Framing goes amazingly fast, particularly if the walls are built off-site and you are using roof trusses. Whether stick building on site or using pre-fab’d framing components, in just a few days the framing is typically complete. Once the framing is complete the sheathing is attached to the walls and roof. 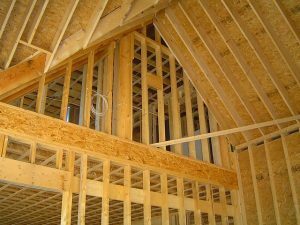 If the addition was not constructed on a slab, and floor joists were used instead, ¾ inch tongue and grooved sheathing is also attached to the floor joists. House wrap should be applied over all of the exterior walls once the sheathing is nailed to the framing studs. Next comes the shingling of the roof, or whatever roofing material you plan to include in your home addition. Then the house siding should be installed onto the home addition. All doors and windows should then be installed. Once complete the house addition is now considered “button-up” from the weather. With the rough framing complete the building inspector should be called in to inspect it. Use this free window installation calculator to estimate the cost of your windows. Now the electrical and plumbing subcontractors can begin their work in a dry and enclosed space, which makes them happier and ultimately you happier. Bringing electricians and plumbers onto the jobsite prior to the building not being buttoned-up, and while the framing and roofing contractors are still on site, is a recipe for personality conflicts and disaster. When the rough electric and plumbing are complete the building inspector should be called in to inspect it. Once the rough electric and plumbing are in, the insulation can then be installed. Again, after the insulation has been installed, the building inspector should be called in to inspect it. With the insulation complete and inspected it’s time to install the drywall. Professional drywallers work extremely fast. For a typical one room addition they can hang the drywall in as little as a few hours. Then they’ll tape and mud it over a 3 or 4 day period, needing only about two or three hours for each daily visit. After the drywall is complete and the walls and ceiling wiped down they can be primed and painted. After the drywall installation and interior is painting is done the flooring can next be installed. Then any cabinets that need to be installed should be. Next, the plumber and electrician should be called back in to complete their finish work. For the electrician that means installing outlets and switches, as well as lights and appliances. For the plumber, this means installing toilets, sinks and tub hardware fixtures. When they leave you should have running electricity and water in the new home addition. Finally, the finish trim work can be installed. Baseboard trim should be installed around the flooring and window and door trim molding attached. The house siding should be painted and the soil re-graded around the perimeter of the home addition and home. Topsoil should be added and the lawn reseeded to wrap up your home addition project. Lastly, the building inspector should inspect the finished home addition and provide you with an occupancy permit. This will enable you to legally use the room and to trigger a visit by the tax assessor.